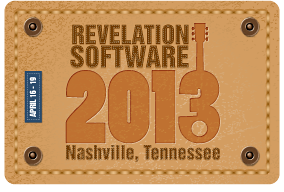 I promise that this will be the final blog entry from me with regards to this years amazing Revelation Software 2013 Conference in Nashville. A thank you to everyone that took the time to attend this year’s conference and to those who gave the presentations. He also thanked Billy Kirsch for a very entertaining keynote address which resulted in Revelation’s very own song – check out the conference highlight video. The Mixer evening (replacing the Vendor Fair) was a great success with at least 8 laptops open and information being shared. This appears to have been a much more casual event enjoyed by all. The conference included over 5 hours of O4W content and most of that being tuition based. Mike hinted at the ‘possibility’ of some of the O4W content being published online for conference attendees or in the WORKS area. OpenInsight 9.4 will be the main priority on the return to the office, as well as OI 10 and the removal of the last traces of Notes from the website. The Notes content is largely (if not completely) being replaced with O4W content. Plenty of fun was had by all during the conference. This included the keynote address and the evening out. Mixed with alot of technical content and learning and this conference has proven to be another huge success and rewarding for all who attended. Finally, Mike did not give a date for the next conference but asked for some feedback on the current conference and whether people would like another on in 12 or 18months time. With everyone’s training budgets being stretched and the cost of conference venues and the associated bits and pieces, Mike is looking for some guidance on timescales from those of you that hope to attend the next conference. I think that the cat is out of the bag and, for personal reasons; I was not personally able to make it to the conference this time. However, I fully intend to be at the next one and it looks like I missed a lot of very good stuff at this year’s event. Hopefully these blog postings will have helped to underline what the Revelation Conferences are all about and I hope that you will be able to join me and the Revelation team at the next Revelation Software Conference whenever and wherever it is to be held. Finally, I’d like to congratulate Nancy and her team on a great job, well done. This morning the Revelation Software 2013 conference schedule will be dedicated to the amazing (OK, I’m more that a little biased) O4W. This easy to use web technology has proved to, yet again, be a highlight of the conference and it will feature highly on the ‘must find out more’ lists of those developers and users that have made it to Nashville for the conference. Following on the training session earlier in the week, Bob Catalano and Bryan Shumsky will dedicate this morning’s session to Building Mobile Applications with O4W. In this three hour training session, Bryan will build on what developers learned at the O4W Programming Practices session earlier this week and attendees will learn the specific design considerations and techniques needed to create mobile web applications using O4W. Basic+ programming experience and familiarity with the powerful O4W APIs is recommended for this session. With mobile applications becoming more and more important to businesses and individuals, this will be one hot, HOT, topic to close out the technciual side of this years highly educational conference. So, an action packed day two draws to a close and this evening the entertainment turns to the traditional conference dinner event. This year, it takes place at Nashville’s famed Wild Horse Saloon, where the food is intoxicating and corporate events are…a little less corporate. As today’s breakout sessions draw to an end there is just time for a presentation from Mary Jean Blink and Bob Cloney and they will be up against another double act, this time Andrew McAuley and Aaron Kaplan. Any business application designer should recognise that time is one of the most costly, yet frequently overlooked, expense incurred by business. Once the value of time is lost, it will never be recaptured. Business data is an invaluable commodity that is collected and stored in large quantities. However, time consuming processes are often required before data can be abstracted into relevant business information. We are challenged to deliver the right information, to the right people, at the right time…IMMEDIATELY!!! Does your business or client struggle to manage multi-valued relational data and transform data into meaningful business information? Have you considered how much time is lost to retrieving and processing data before truly valuable information can be presented to and analysed by your application’s users? Are you concerned about the performance of your application on a network and across the cloud using O4W? Do you fear using relational indexes and have you heard that you should never put a Btree index on a symbolic? This presentation will aim to dispel the myths and put your data to work using a strategic combination of relational indexes, Btree indexes and practical user interfaces. During the presentation, Mary Jean and Bob will present a demonstration of the methods and techniques to abstract real business data into valuable and timely business information. Many Revelation developers have been working with OpenInsight for a good number of years and they have a wealth of tools and utilities to manage and to include in robust system deployments. During this presentation, the Sprezzatura team will explain how package management has helped to manage their plethora of tools to create consistent deployments without accidentally reverting entities. Package management allows for the generation of deployments ensuring that the correct software versions are always deployed. In addition to the thorough discussion that you have come to expect from a Sprezzatura presentation, Andrew and Aaron will also be demonstrating the organisation’s in-house tool which now manages and creates all of Sprezzatura’s software distributions. With lunch over the conference heads into the afternoon schedule and a full afternoon of breakout sessions. The first of which will see Kevin Fournier and David Hendershot take to the spotlight. In today’s modern software development environment, integration with Microsoft Office is not just desirable, it is down-right necessary and expected these days. During this presentation, Kevin will demonstrate how to interact with Outlook using OLE Automation to enable OpenInsight based applications to programmatically manipulate email, appointments, or contacts. Attendees will learn how to employ these techniques in their own applications and, as a result, will acquire enough skill to explore interaction with other MS Office products such as Word or Excel. The OpenInsight Console is sure to become one of the key tools for system administrators and support staff looking after OpenInsight based systems. During this session David will look at the programming techniques used to develop the OI Console using O4W’s application programming interface.